In this post, I will tackle some of the app-related problems Samsung Galaxy S6 Edge Plus (#Samsung #GalaxyS6EdgePlus) owners have encountered including the issue with Smart Stay, which according to reports, doesn’t work all the time. The second problem is about the error message “Unfortunately, Music has stopped,” which is a bit strange since the app is pre-installed and therefore, should work seamlessly with the firmware. Other issues include video and music download app that the owner can’t get to work and the Google Music that glitches. Then there’s an issue with the setting up of a Yahoo Mail account and a question on why YouTube can’t play videos with 60 FPS. Read on to know more of these problems and how to tackle them in case you’ll encounter them in the future. If you found this post while searching for a solution for a totally different issue, then visit our Galaxy S6 Edge Plus troubleshooting page where we list down every problem we address each week. Find problems related to yours and try the existing solutions. If they won’t work for you, then contact us by filling up this form. Problem: Hi. Smart Stay not working especially while watching Facebook videos. 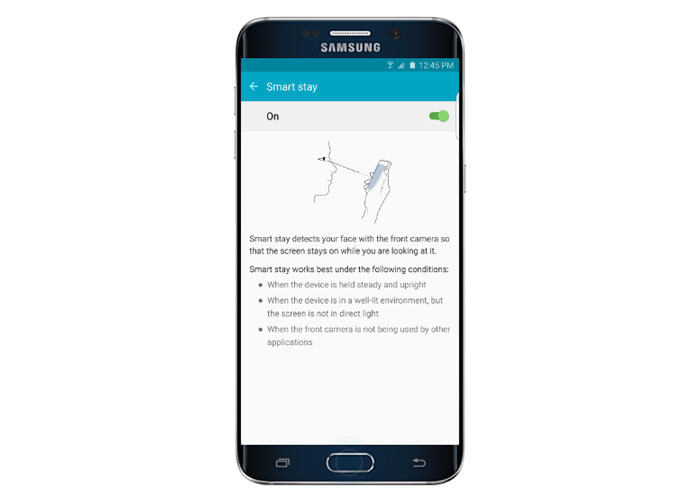 Troubleshooting: This is a common problem with Samsung Galaxy devices and while Smart Stay is a cool feature, it still needs a lot of improvements…and yes, it doesn’t work almost half of the time. Only Samsung can fix this problem by enhancing its capability. As long as the app itself doesn’t crash, the problem is with the face recognition. The only thing you can do is make sure you’re in a well-lit place and that nothing obstructs the front camera. Again, it’s a cool feature but not reliable. Problem: I have a video download app. I can’t get the app to work. Same thing with my music downloader. Troubleshooting: For our readers who may be able to read this, please provide more information when asking for help. The phrase “I can’t get the app to work” is just so vague plus the name of the app(s) weren’t included. But since our reader here contacted us, we are obliged to respond. If the app hasn’t been working since the installation, then it’s not compatible. Uninstall it and find other apps that offer the same service. If the app worked and for some reason stopped, it might still be a compatibility issue but you might just need to update it for it to work again. If there’s no update available, contact the developer. Problem: Google Music has glitches and pops in music playback on music stored on phone. It’s not in the music files because if I replay the same section of the song the glitch is not there. I’m using wired Etymotic ER-23 HF-3 headphones. Troubleshooting: Does it happen to all tracks? If it does, then it’s the app that has some issues. However, if the app has been working properly before and then out of the blue these glitches happened, you might want to try using different headphones just to rule out the possibility that it’s an accessory issue. There are other music apps you can use if it happens to be an app issue. Some of them even offer really cool features not offered by Google Music. It’s up to you if you want to dwell on this problem or move on by using other apps that don’t have glitches. Problem: I cant set up yahoo AT ALL it keeps says email/password wrong or authentication failed. thought maybe I had my password wrong so I changed it ,and i can log in on online but cant set it up on my phone, I am sure its just some setting but I am about to smash my brand new phone. Suggestion: Let me guess, you’re trying setup your Yahoo Mail account using the stock Email app, am I right? You need to do everything correctly for it to work successfully. That being, try to follow this guide (provided by Yahoo! Itself). But you know what, there’s an easy way to setup your account without worrying about all the settings–just download and install Yahoo Mail for Android. Once you’ve added your account, it should work flawlessly as it has direct access to Yahoo’s servers. Problem: YouTube on this device will not play videos that are 60fps. Answer: Back in May or June, YouTube rolled out an update for its app that support playing of HD videos including those that have 60 FPS (Frames Per Second). So, I find it surprising to know the app in your phone still can’t play those videos. When inside the YouTube app, touch the Menu in the upper right side to display some options. Choose “Quality” and you should be able to see quality options that may include “720p60” and “1080p60” if the video supports it. If these options aren’t available, try to see if the app needs an update, if there’s none, then there’s no other option but to wait. There’s not much we can do about that for now.